It was 23 degrees, cold and dark. I was leaving Cleveland in the dead of a cold winter’s night. I’d been invited by BFGoodrich to the unveiling of their newest, ultra-high performance summer tire, the BFGoodrich g-Force Sport COMP-2. Oh, and the event was being held in sunny southern California. It didn’t take much convincing to get me on the plane. The COMP-2 is BFGoodrich’s answer to the new breed of high-tech ultra-high performance tires on the market. Three years in the making, the new tire uses a new silca-infused rubber compound and reinforced internal structure to improve grip in all situations. In comparison to the other leading tires in this category, the BFG claims a 30% increase in grip in wet conditions while maintaining an 8% lead in the dry. BFG is going for the enthusiast aftermarket where tire performance and looks trumps most other factors. With over 50 diameter and width combinations available, it’s designed to fit most foreign and domestic sports cars. Fast forward 32 hours to the Auto Club Raceway at Pomona, California. 67 degrees and dry as a bone, the perfect weather to put the new tire to the test. BFGoodrich had prepared several different events for us to try out the new g-Force Sport COMP-2, and better yet, to compare it to the competition. For every car clad in the new COMP-2s, there was at least one other car of the same model shod in Yokohamas, Coopers, Hankook, and other leading brands. We had the opportunity to test back-to-back the BFGoodrich offering against the industry leaders. By “we,” I mean some of the biggest names in the automotive press: Car & Driver, Autoweek, Hot Rod Magazine, and of course, Bullz-Eye. I have to say I was more than a little intimidated by my peers. I have no illusions about my driving skills; I’m enthusiastic, but in no way experienced. The one goal I had during the whole event was simply to NOT make a fool of myself. First up was the zero-to-60-to-zero test. This allowed us to test the stopping power of the new tire. 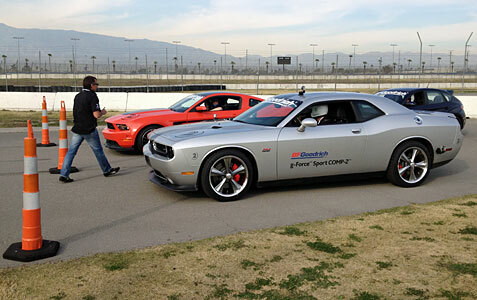 Using Chrysler’s awesome Challenger SRT-8, we rocketed to 60 miles-an-hour down a straight line. At a cue from the instructor in the passenger seat, we stomped hard on the brakes, causing the car to shudder to a stop down the course. Using onboard data-gathering equipment, we were able to tell how effective both the BFGoodrich g-Force Sport COMP-2 and its competitor (the Yokohama S-Drive) were at stopping the bulk of the Challenger. The difference was telling: the COMP-2 stopped in a shorter distance than the Yoko by at least five feet on average. Is five feet important? Five feet can make the difference between hitting another car and stopping short. Every foot counts when it comes to stopping distance. Up next were the wet and dry autocross circuits in VW GTIs, Subaru STIs, Challengers and Camaros. Again, we drove while instructors rode shotgun, giving us greenhorns quiet suggestions and a boost of confidence as we negotiated the course. I have to say, the COMP-2s definitely gave you more confidence through the slaloms and the sharp turns. It was “grippier” than the Hankooks and Kumhos we tried; more so on the wet than the dry, but a noticeable difference nonetheless. BFG is going for more than just performance in the COMP-2. With performance tire shoppers becoming more discerning, it’s also important to look good. From that aspect, I think they hit the nail on the head. With a more prominent side wall and a cleaner design, these tires look like they’re made for the track. On the Mustang Boss 302 they look mean. Finally, we had an opportunity to take a Camaro clad with the COMP-2 (and again with a competitor tire, the Yokohama) around the track. Once more, my desire not to screw up (not to mention the waivers I signed earlier in the day) made me nervous – that is, until I got behind the wheel. Our friendly instructor co-drivers gave us more confidence than we probably had a right to have behind the wheel of a high performance car. Around the track we went, navigating around gate cones that gave us the proper line through the course. The COMP-2s again showed their mettle. It was more of a challenge in the competitor tire to hold the line than it was in the BFGs. The added grip made it possible to go faster without the sense that you were losing control of the vehicle. Finally, the instructors – who were BFGoodrich ambassadors from all around motorsports – gave us journalists the ride of our lives around the Auto Club Raceway at speed. I went for the Mustang Boss 302 ride first. What a car. Going flat-out sideways through the cones with the engine snarling and tires squealing, it was quite a thrilling ride. The drivers went all out with the assembled cast of sports cars. It was the perfect way to end the event. BFG announced that the BFGoodrich g-Force Sport COMP-2 will be available for purchase in early April 2012 for the most popular sizes. The balance of the fitments will be available in the third quarter of 2012. Check your favorite tire outlet for availability in the spring. Stepping onto the plane heading back to Ohio, I thought about what I’d seen. BFGoodrich is taking the ultra-high performance market seriously. That market is showing huge growth in the industry as the popularity (and horsepower) of the sports car market grows. It’s been a long time since the big three American car companies have all had competitive big-block pony cars. BFG is stepping up its game to meet the challenge. At the end of the day, it boils down to choices. Several big brands have very good offerings in this segment. Not only the Yokohamas and Hankooks we rode on, but also Nitto and Goodyear and several other brands. Why would you buy the BFG COMP-2 over one of these other tires? As a guy with a Mustang himself, I’d have to say the BFGoodrich g-Force Sport COMP-2 is more than a match for the competition. The next set of rubber that goes on my Shelby will most likely be the g-Force Sport COMP-2s.